A Community of Practice (COP) refers to a group of people who share a concern or a passion for something they do and who interact regularly to learn how to do it better. (Wenger 2006). In 2004, New Hampshire joined the National Transition Community of Practice led by the IDEA Partnership. More on the theory behind Community of Practice. 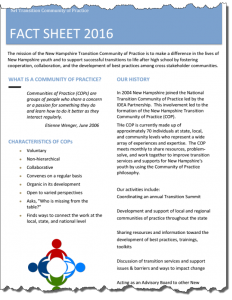 New Hampshire Transition Community of Practice Coordinating Group. This group meets monthly to share resources and problem-solve barriers and issues. All are welcome at the monthly meetings, usually 9-11 a.m. on the first Thursday of the month in Concord. Come regularly or drop in occasionally. For more information, see the NH Transition COP Fact Sheet or send an email to NHCOP. Review NH COP minutes on Google Drive. Greater Seacoast: Email contact person at Transition Resource Network at Strafford Learning Center to get meeting information or to get on the resource email list. Manchester: Email contact person at the Moore Center. Southwest: Keene State College hosts a periodic Transition COP meeting, coordinated by the Monadnock Center for Successful Transitions (MCST). If you are interested in joining this COP, receiving email resource announcements, and/or attending meetings, email the contact person at Keene State College. South Central NH: Email contact person at Gateways Community Services to get meeting information or to get on the resource email list. School Behavioral Health Community of Practice: Email contact person at the NH Department of Education to get meeting information. Start a Transition COP group in your part of the state! Please email a request. Regional resource lists compiled by local COPs.